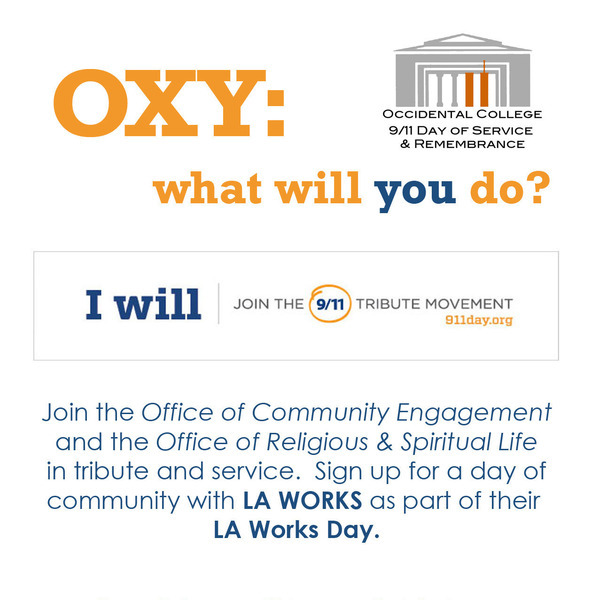 On Saturday, September 6, the Occidental community will work with LA Works during the LA Works Day of Service. Volunteers will be rolling up their sleeves as you get to know a vibrant community nestled in six square blocks of the Boyle Heights neighborhood. Volunteers will be painting, planting, landscaping, building and gardening at a Los Angeles Unified School District title one elementary school where at least 40% of the students are from low-income families, a public pre-school, a city park, and a community garden. Log in to see who is volunteering for Oxy 9-11 Day of Service!